Hibernian boss Colin Calderwood insists his assistant manager, Derek Adams, was wrongly dismissed on Saturday. Adams, who is currently contesting a four-match touchline ban, was sent off during Hibs' 2-0 loss at Motherwell. As he was serving a six-match ban when he joined Hibs in November, he is now likely to face the Scottish Football Association's disciplinary committee. But Calderwood said: "The frustration is for him, because what he's been accused of doing, he hasn't done." Former Ross County manager Adams was ordered to the stand by referee Alan Muir on the advice of fourth official Kevin Clancy for what Calderwood was informed was foul and abusive language towards the referee. 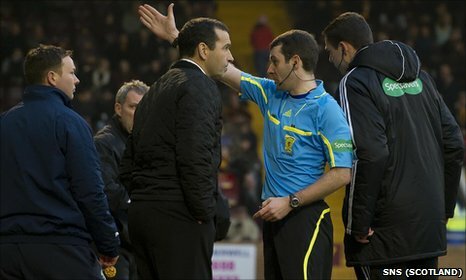 But Calderwood pointed out that Adams does not swear and that his comments were directed towards a Motherwell player. "It backs on to what has happened to him before," explained the Hibs boss. "There was no reason for him to be sent off on Saturday and that's the thing that is irritable. "It's the wrong call. It wasn't an instant, instant decision. There was plenty of time to have a thought process about it. "It's not something that happens in the heat of the moment. It was the fourth official's decision to bring the referee over and then tell him what he's alleged to have said." The incident is the fourth time the former Ross County manager has been reported by match officials over a three-year period, meaning his situation will automatically be discussed by the SFA's disciplinary committee. Adams received his most recent punishment following Ross County's Co-operative Insurance Cup defeat by Dundee United in September. The 35-year-old was reported for an incident in the tunnel while serving the final game of an eight-match touchline ban. The former Motherwell and Aberdeen midfielder accepted an automatic six-match ban for that "misconduct" incident but is appealing against an additional four-match punishment for breaching the terms of his initial suspension by being in the tunnel.